Just moved to Los Angeles? Welcome to our city, we are here to help you get settled in. We have 3 great "Weclome to Los Angeles Specials, that will include frame, futon/or innerpsring and cover all at one super price. We are the oldest futon store in Los Angeles...We hand make all our futons right here at the Futon Factory L.A...we believe in small buisness and the community. All of Futon Factory L.A. foam products are now made with soy bean foam. For more information about soy bean foam, click the link below: . New online specials available today. Exclusive online prices! New pet beds are here! Custom pet beds made from Microfiber fabric with removable covers! Call the store for more details. 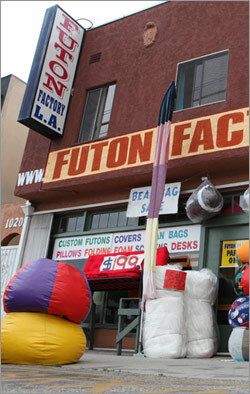 Futon Factory L.A. would like to thank you for coming to their website by giving you a 10% off coupon. Just print out the coupon and present it to the sales person at the store. *Coupon can not be used in conjuction with any other sale or discount.